Found at the Puma Punku site in Tiahuanaco are the ruins of a massive temple complex, including many hewn stone structures with extremely intricate mathematical-based carvings. Some of the stone edges are still sharp enough to cut. The process is not known how these megalithic stones were shaped and the joints are so precise that paper will not slide between the stones. A large number of the stones are interchangeable, designed to fit into each other and provide a level surface. Carbon dating of the oldest layer of soil below the ruins estimates Puma Punku, or Door of the Cougar, construction to have started between 530 and 600 CE though there has been great debate over these figures along with the methods purposed to move the gigantic blocks, some weighing up to 100 tons. Evidence suggests that Titicaca was once a saltwater sea with the shores filled with fossilized seashells and seahorses inhabiting the water today. Now 10,000 ft. above sea level, one of Titicaca's largest islands is known as Isla del Sol, or Island of the Sun. The Inca believed this island is where the Sun God was born and placed many offerings here for approval. Over 180 ruins dating to the 15th century can be found the among steep agricultural terraces. 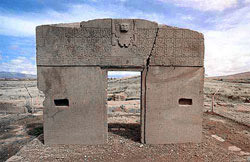 Located only a few miles away from Titicaca is whats known as Aramu Muru's Portal, found in the Valley of the Spirits. Essentially, it is a doorway-shaped carving in the middle of rocky outcrop which in itself appears to have been molded into shape. Local legends suggest people have vanished through the stone doorway.